Dipa Vasudeva Das is rather mysterious. 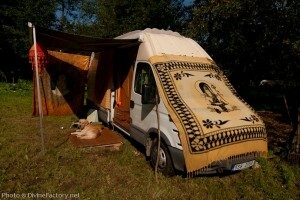 A Slovak man with a yogic belief system, he creates and transforms the mundane into the beautiful. Working with spun-wood and two-dimensional imagery, he is probably best known for converting ordinary cargo vans into fabulous tiny houses. In fact, he lives in one himself. 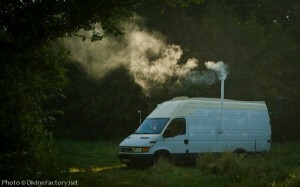 He began with a completely gutted cargo van, as seen in this photograph taken from the front. It is also shown in this one, taken from the back. He then began to build up the walls. This provides insulation for temperature regulation, as well as an even surface on which to work. Then, Dipa added wood paneling to the walls and roof. It is on this base that he became truly creative. 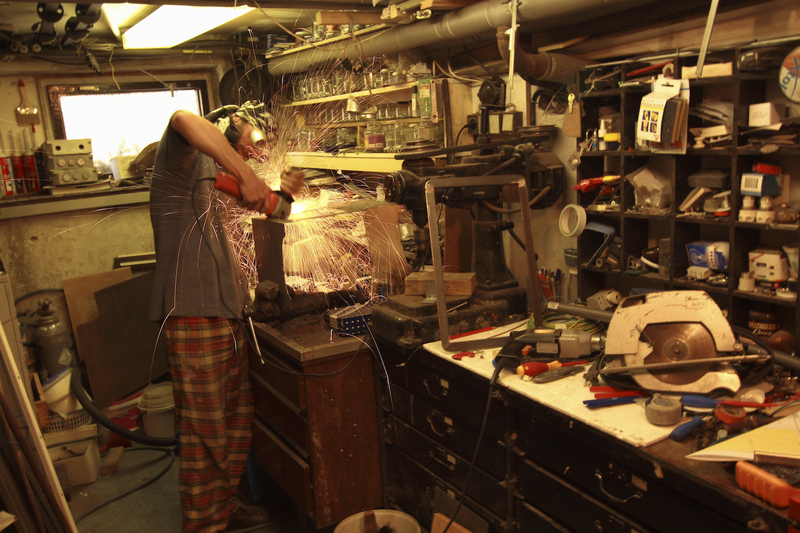 He started working on the frame, of what would become the various levels of the tiny house. This type of layout is visually interesting, and offers unique storage options, as well as the illusion of more space. Dipa Vasudeva Das is ever mindful of his craftsmanship. His spiritual philosophy reminds that the manner in which something is created–and the love with which it is infused–is integral to what it becomes. 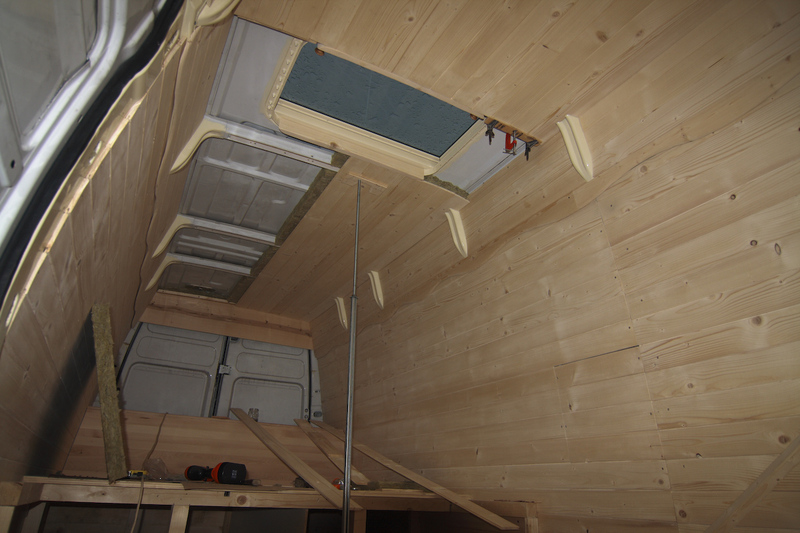 This photograph shows the base of the interior of what will become the loft for the bed. Here, you see the loft for the bed, in the back under the window. This provides abundant room for convenient storage by way of the many drawers. With the skylight, and several decorative, yet functional windows, there is plenty of natural light to brighten up the space, and make it appear larger. 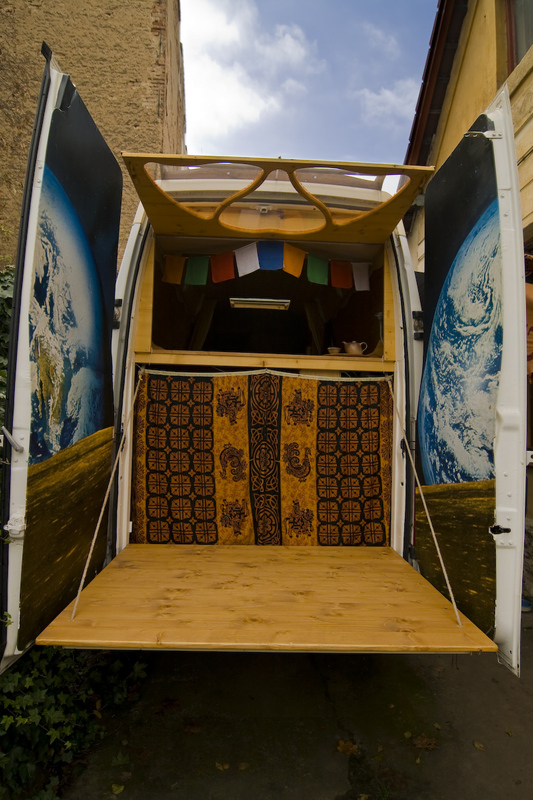 Where most van conversions neglect the exterior, Dipa brought his vision outside. 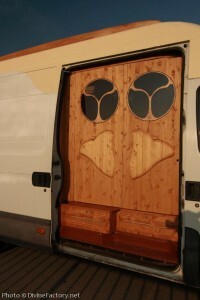 The side door provides a hint of the design inside. 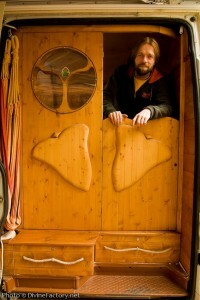 The rear barn doors were decorated to demonstrate the tiny house’s name: Earthship. It seemed appropriate. The fold-up window shown is the one at the head of the bed loft. When opened, it allows the cool night air in, while he sleeps. Every inch has a purpose. 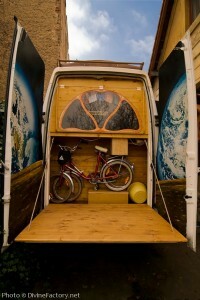 The space in the back is perfect for storing a bicycle, or other outdoor equipment. 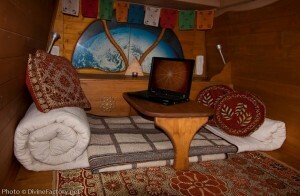 Here is the Earthship after its transformation into the cabin-like tiny house that it is. The kitchen and dining areas are quaint and offer plenty of cabinet and counter space. The wood-burning stove provides heat, as well as a convenient method to cook. With this stove, he could live off-grid as long as he wanted. 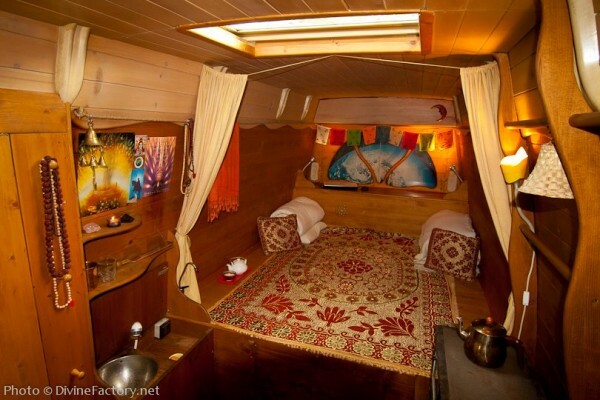 With yogic austerity, the furnishings were minimal. 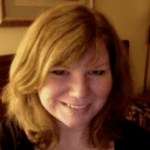 This not only adds to the atmosphere, but also means that there is little to clutter up the space. The small dining table is easily removed, when it is not needed. Curtains help divide the area into separate rooms. This allows for open spaciousness during the daytime, and privacy at night. 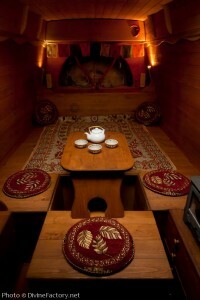 Every space was given as much attention to design and detail as every other. 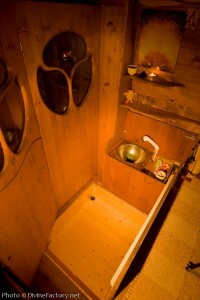 The bathroom is more reminiscent of a spa, than the generic contemporary ones found in most motorhomes. With the unique design elements, various levels to define rooms, and clever use of space, there is more than enough room. The loft–usually used as a bedroom–makes a perfect place to entertain guests. Plus, storage is found in the most unusual places. 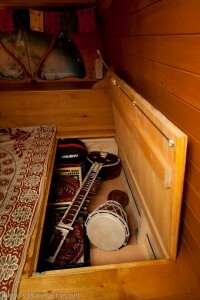 The musical instruments go in a cubby under the floor. 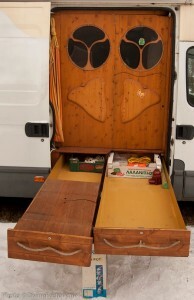 There is even a full-width slide-out storage located under the side-door. 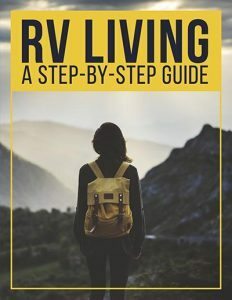 Similar to the basement of an RV, this area stores out-of-season items, tools, and outdoor equipment, which are easily packed out of the way here. 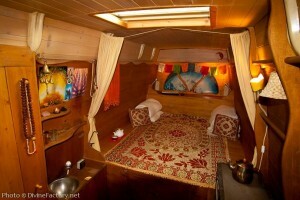 All the additional places, for storing his belongings, ensure that Dipa’s living space remains clean and clutter-free. In the back of the van is a peaceful oasis where Dipa’s minimal needs are met. His mat rolls up easily to be stored out of the way during the day. When spread across the width of the loft, the mat provides plenty of room to relax without taking up too much space. At night, he can turn it lengthwise, to enjoy a full-sized mattress where he can stretch out. There is definitely more than enough room, and without a conventional mattress, he has the flexibility to adjust it to fit whatever suits him in the moment. With ultimate versatility, the loft makes a perfect place to rest, but is also attractive and comfortable when entertaining guests, or even engaging in yoga poses. Dipa’s philosophy embraces a deliberate and calm lifestyle. 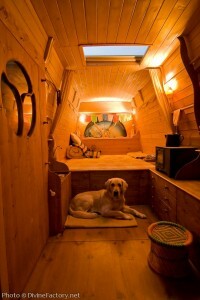 He has what he needs, and has created a space that reflects his personality. 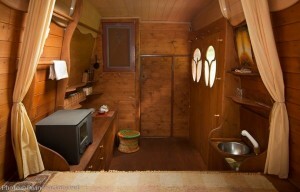 With each detail of his tiny house painstakingly crafted, he surrounds himself with the beauty of his handiwork. Beautiful two-dimensional images are often displayed in an adjoining tent, to further demonstrate the art of the Divine Factory. 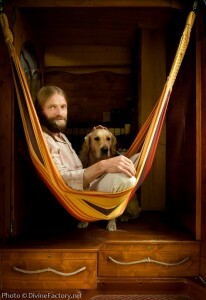 In this photograph, you see how he extends his space to include the outdoor, allowing nature to be part of his home. 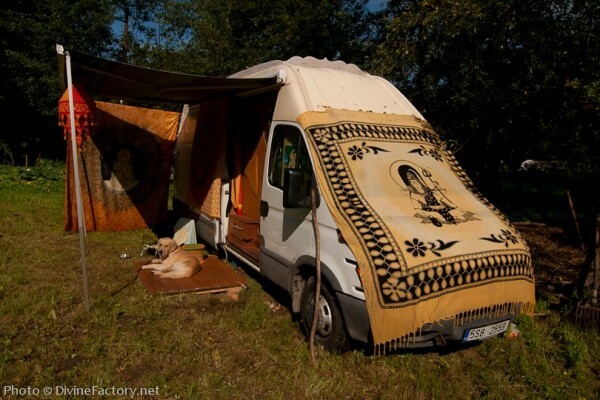 Earthship by name and demeanor– what started as a humble cargo van has become so much more. 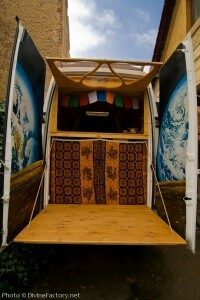 Although this may not be feasible for everyone, it definitely demonstrates a unique perspective on DIY van conversions. 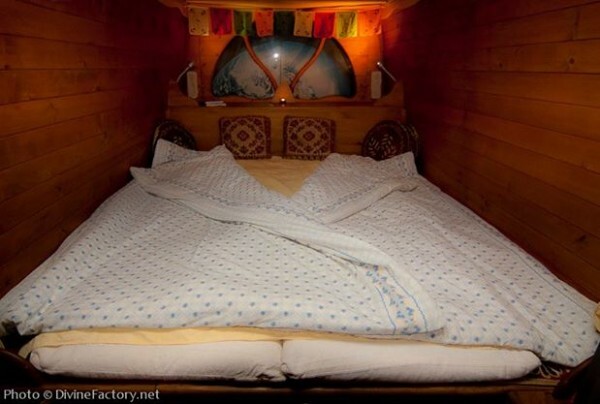 Tiny houses are renowned for their restricted carbon footprint, and with the minimal use of modern conveniences, this cabin-van fits the description. Also, these minuscule abodes are famous for their clever use of space to make the most of the reduced square footage they are allotted. With the many built-in drawers and cupboards, Dipa has fulfilled that requirement, as well. 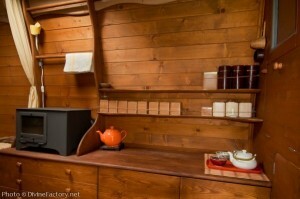 Whether you prefer an RV with all of the modern “bells and whistles,” or you like the idea of a rustic oasis, this handcrafted cabin shows that there is something for everyone. The most important thing is to find inspiration, and choose a style that works for your personal needs. 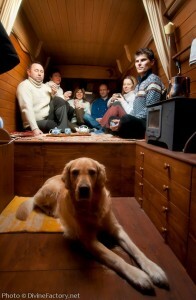 If you are going to be spending time in it, it should surround you with an environment you love. I’m sure Dipa Vasudeva Das would be content knowing that you were inspired.